Microvascular contacts or compressions of the vestibulocochlear nerve can result in tinnitus. For nonpulsatile tinnitus, the contact is most often at the central nervous system segment. For pulsatile tinnitus and typewriter tinnitus, the contact is at the peripheral nervous system segment. The tinnitus is unilateral and characterized by intermittent paroxysms of tinnitus. A typical development consists of progressively more frequent bouts of tinnitus, which last longer and longer. If bilateral vascular compressions exist, the tinnitus alternates between the left and right side, and does not occur on each side simultaneously. Associated symptoms are correlated with related contacts/compressions of nearby nerves and include overt or cryptogenic hemifacial spasms, geniculate neuralgia, optokinetically induced short bouts of disabling positional vertigo, and tinnitus frequency-specific hearing loss. Auditory brainstem responses (ABRs) correlate with disease progress and clinical symptoms and can be used diagnostically. 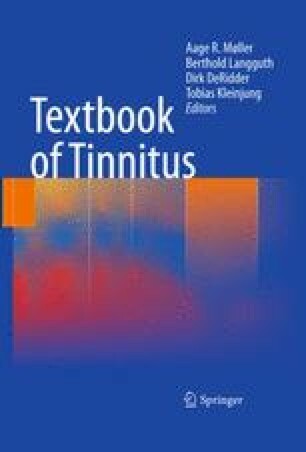 Tinnitus is causally related to a decrease in amplitude of peak II in the ipsilaterally elicited ABR. Tinnitus frequency-specific hearing loss is causally related to prolongation of the ipsilateral interpeak latency (IPL) I–III. Prolongation of contralateral IPL III–V occurs and is a sign of slowed signal transmission in the brainstem. Magnetic resonance imaging sequences with constructive interference in steady state can visualize most vascular contacts/compressions of the auditory nerve. Microvascular decompression should be performed before irreversible nerve damage is induced; clinically, the procedure should be performed before 4–5 years.